Behold the versatility of the color blue. Dark blue lends a sense of masculinity which is ideal for any man cave while light blue lends a sense of calm and airiness, ideal for a spa-like retreat. Deep turquoise lends a bohemian feel and then there’s the classic sea blue which is the ideal backdrop for coastal-influenced design schemes. Should you be undecided about which blue to choose, just rest easy knowing that none of these shades will give you the blues. This room is ready for new furnishings and accessories. 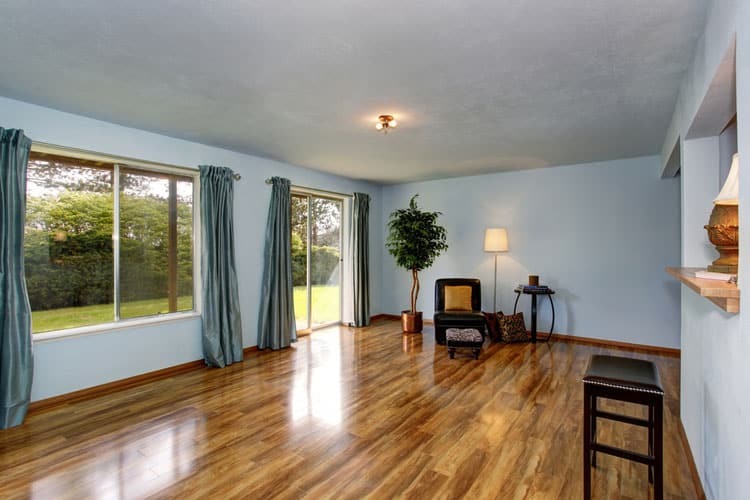 The light blue walls will make easy work of decorating, as many colors will work in this space. The existing pieces do work in this space and the gold accent pieces really pop against the blue wall color. This living room proves that rich shades of blue, much like this dark turquoise, are the ideal complement to gold tones. 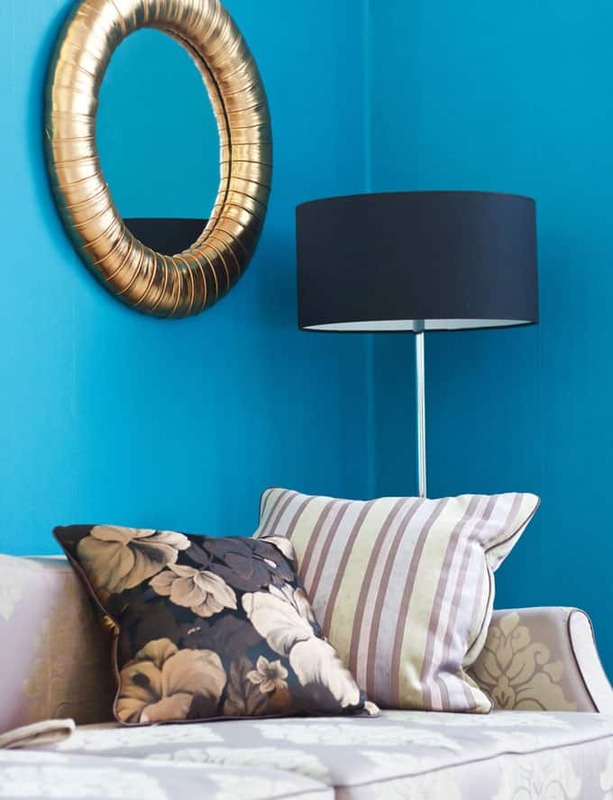 The gold mirror frame pops against the rich blue wall. 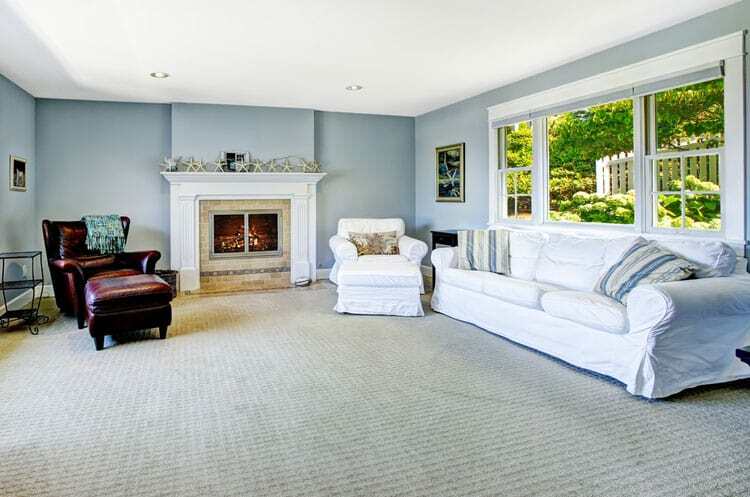 The muted grays and yellows of the sofa and throw pillows balance the space and don’t compete for visual attention. Do you want to know the trick to perfectly capturing the beach house essence? 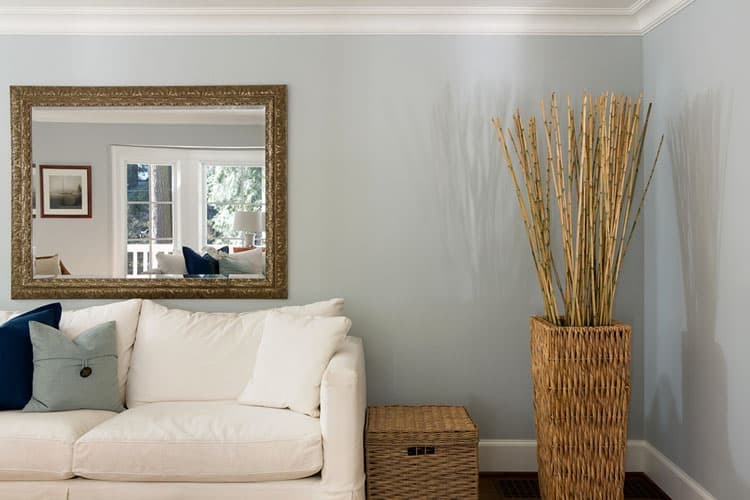 Paint your walls this same shade of blue with gray undertones. This paint color evokes the color of the splashing surf. Pair this color with coastal accents such as driftwood pieces and wicker furnishings, and it’s almost as if you’ve moved out to the coast. Look at all of the details of this living room. The architectural details on the walls are highlighted by the antiqued paint finishes, featuring colors such as grayish white, navy blue and turquoise. The room divider is an ornate piece of functional artwork and the ornate blue sofa and armchair ideally complete the space. This cheery room must look like summer year-round. 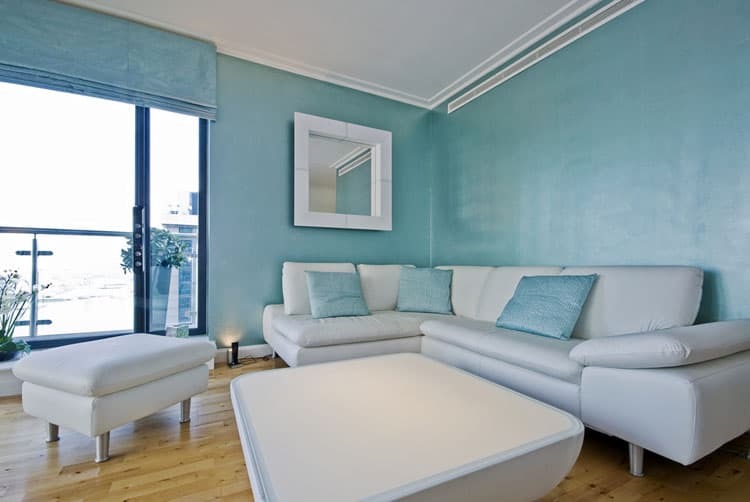 The wall color, a muted blue, is reminiscent of the ocean and the slipcovered white sofa and armchair look like the ideal place to rest after a long day of sunbathing. The fireplace surround, painted a crisp white, looks like it belongs in a coastal cabin when paired with the decorative starfish on its mantel. Can you feel the fun energy of this bright, sun-filled room? 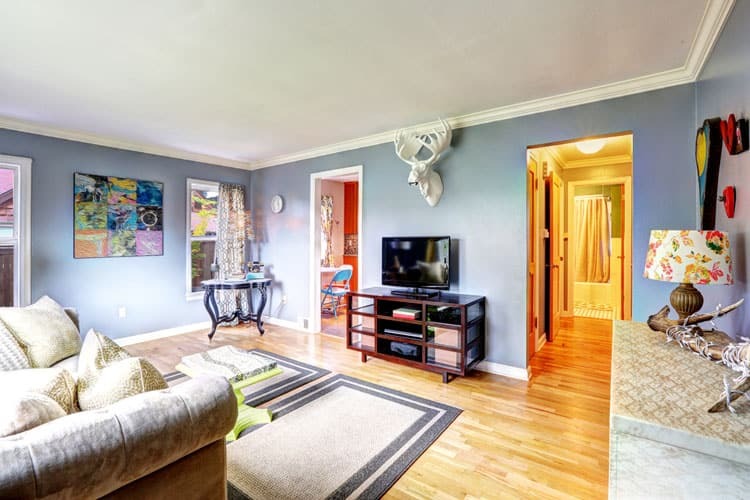 There are so many fun accents, such as the elk head on the wall and the chartreuse end table. Look at the stenciled bookcase in the corner on which rests a decorative piece of driftwood which is in an artful tangle of twinkle lights. So fun! Wow, look at that floor lamp. 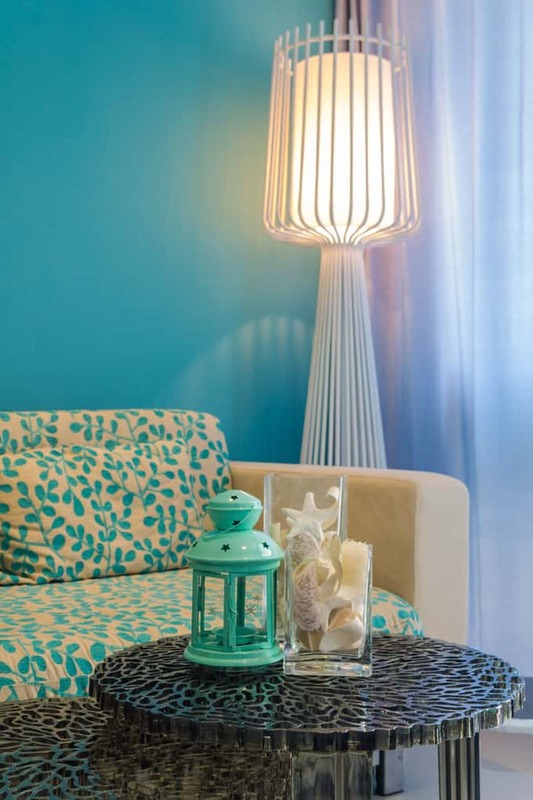 This arty lamp is reminiscent of jellyfish, which helps this room evoke a coastal feel. The cool turquoise walls and seashell accessories amplify the coastal look. Wow, this looks like the living room where summer never ends. 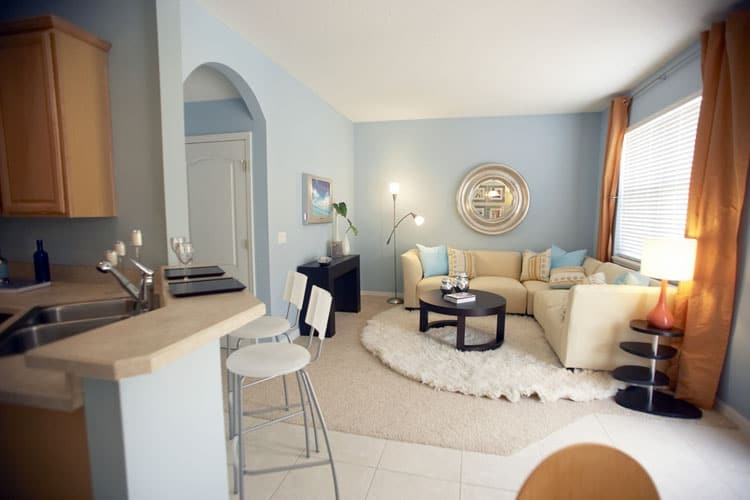 Imagine relaxing on that comfy slipcovered white couch while sipping a drink after a long day at the beach. The tall vase and chest, both made of wicker, lend texture and visual appeal to the space. 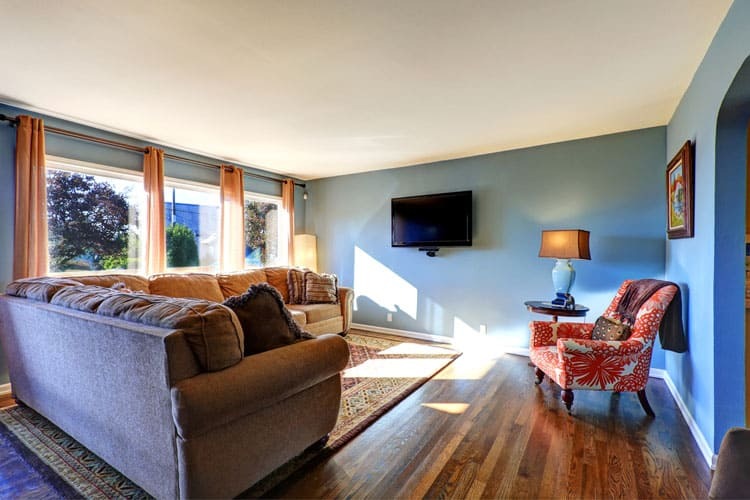 This bright, deep blue living room screams fun. Colorful throw pillows bring in more color and the artful accessories, especially the clock carefully positioned on a pile of books, scream fun. This room looks like the ideal space for an epic games night. 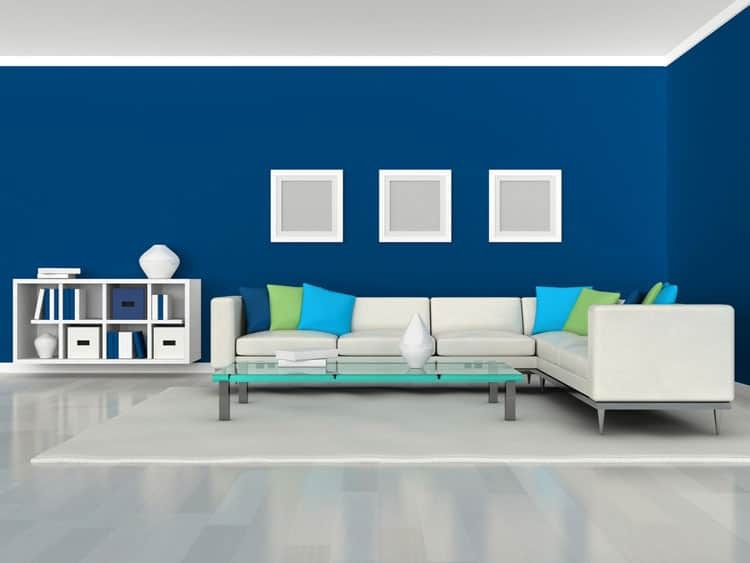 Bright blue makes the ideal accent wall for this modern space. Funky white cabinets have two functions: storage and art piece. 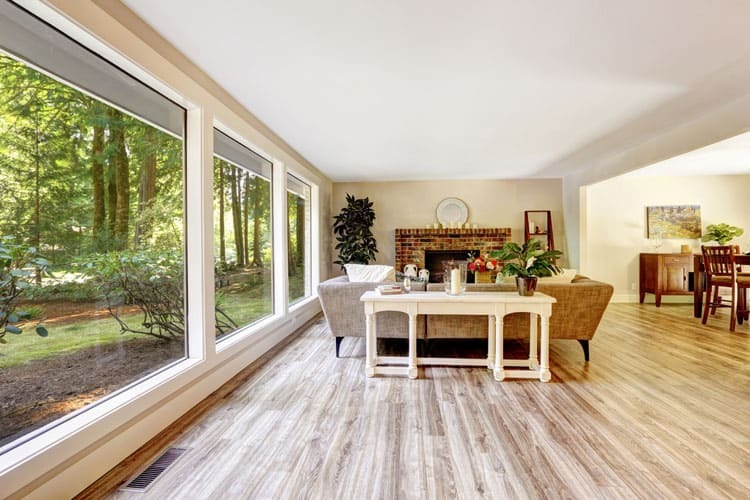 The light gauzy curtains cover the floor-to-ceiling windows and let in just enough natural light. Dark blue walls set the scene for this modern room. The many shades of white, found in the accessories and the furnishings, make a sleek impression. 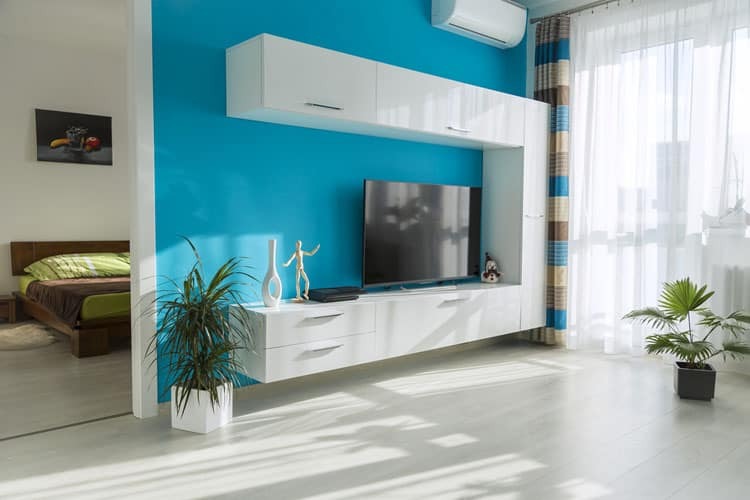 Other colors, such as turquoise and lime green, are used sparingly but make a big impact. 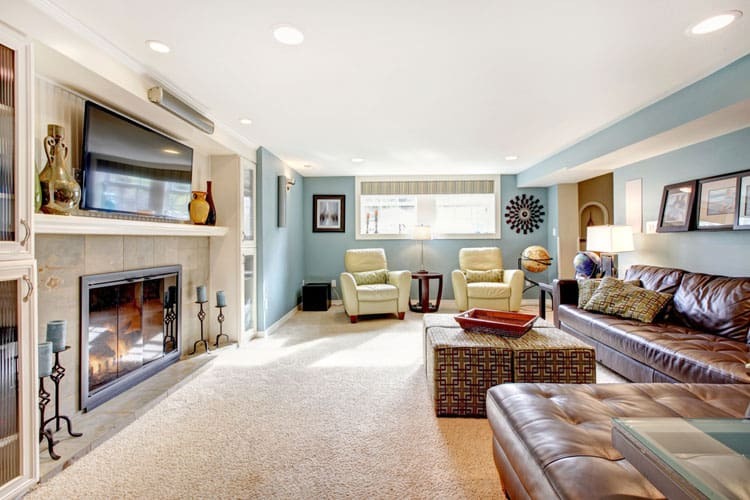 This fun and functional family living room looks like the ideal place to watch the big game or the latest movie. The large brown sectional guarantees seating for everyone while the red-and-white armchair in the corner provides a fun pop of color. 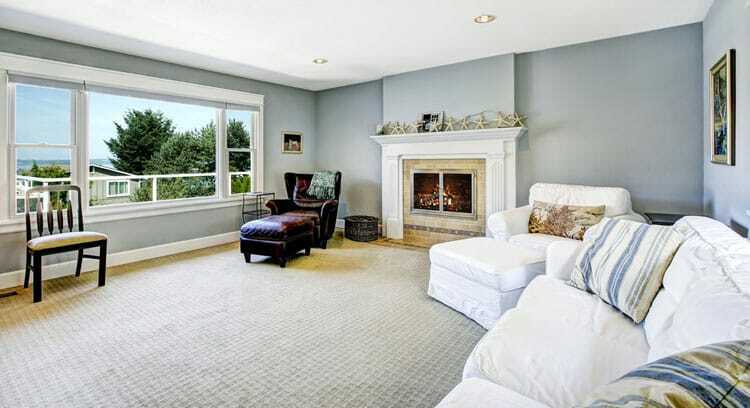 This room has a lot of beautiful features, from the grayish-blue paint color to the tan tile fireplace surround. However, take a look at the view of the water. The best spot in this room may just be sitting on that white slipcovered couch, leaned back against a grain sack throw pillow and staring at the nearby water. The bright, white leather sectional pops against the light blue living room walls. 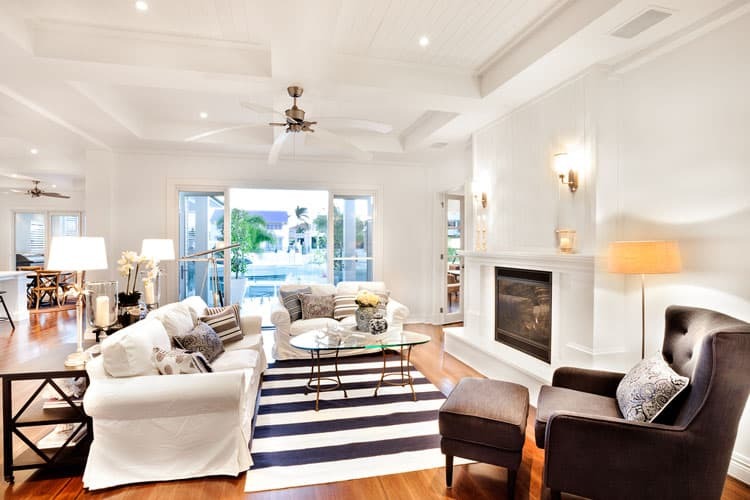 The minimal color scheme, blue and white, creates a space with cohesion and a sense of freshness. This living room is made for all sorts of entertaining. Have the gang over to watch tv while lounging on the over-sized sectional or enjoy some special one-on-one time in front of the fireplace. The twin leather armchairs on the other side of room create a separate conversation area for party guests looking for some quiet. There are a lot of fun details in this open-concept living and dining room. 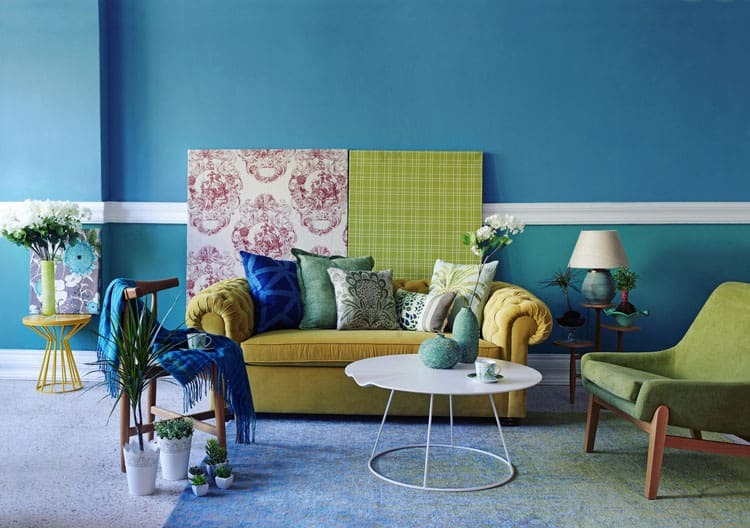 The pops of lime green, funky blue ottoman and cool blue walls create a fun space. The conscious use of stripes, in the artwork, rug and vases, create a funky cohesion. This room proves that robin’s egg blue works with coastal decorating style as well as this room’s style, shabby chic. Antiqued furnishings, white slipcovered couch and vintage accessories all work together to create a welcoming, shabby chic retreat. These homeowners know how to make the most of a reasonably sized shared space. The light-colored sectional provides ample seating without taking up the entire living room. The primary decorative accessories are functional, such as the funky many-tiered end table. The flokati rug provides texture and a subtle pop of color. 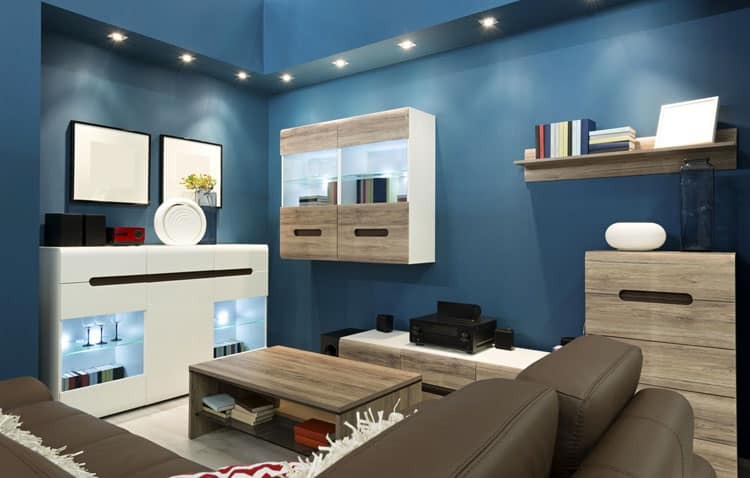 Follow this space’s example when furnishing a small apartment. The sectional sofa and the bench, which doubles as storage, provides seating for all of your friends. The same wood finish on a majority of the furnishings provide stylish cohesion. The lit up shelves in the white cabinet provide light and style. This homeowner knows how to use color and patterns. 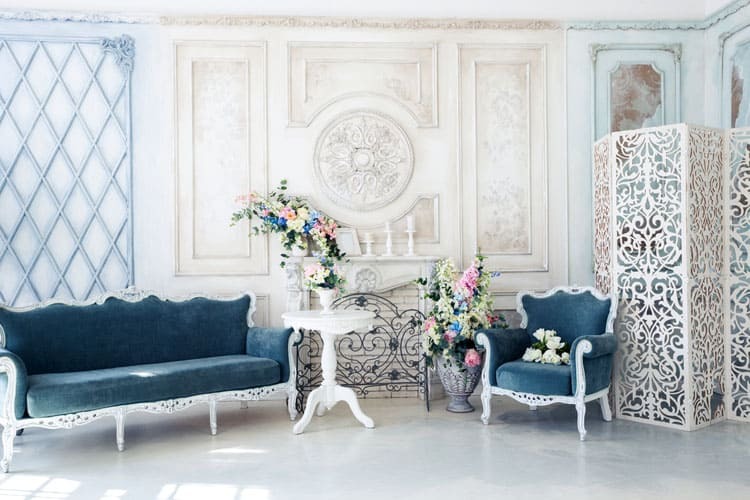 The white wall moulding separates two shades of blue, one turquoise and the other sky blue. The throw pillows, tufted sofa and retro arm chair are all different colors, but work together to create a fun, bohemian living space.